In time, I grew actually to believe that. And as I reflect over my life, there are honestly very few things or people that I hate. I’ve always thought it was such a dirty, beneath-me emotion. I’ve always sought the good in a situation or a person. I try to give them the benefit of the doubt and try to consider what I would do if I were in their shoes. Sorry Robo. This time I hate. 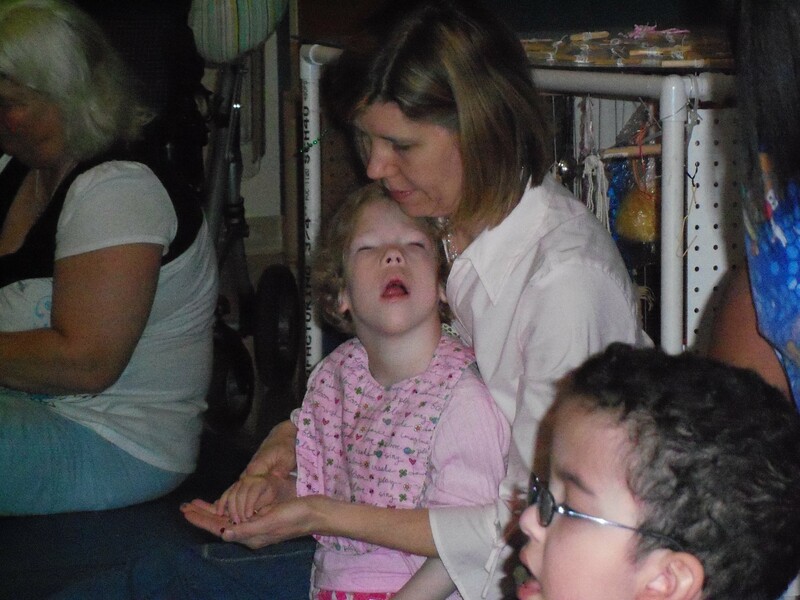 I can’t understand how the people who supposedly come together to determine what Catherine needs in the school environment during the IEP process can make the determinations that they do and then close their eyes at night feeling like they did a good job that day. I need to write about this – confess my hate – to try to understand. Maybe they think they help all the other kids so one they turn their back on doesn’t really matter. Maybe they are super afraid of forces at work that would cause them to lose their jobs. Maybe they realize they only have so much money and they want to save it for the kids who show faster progress. Maybe they… I can’t really think of any other reasons they could actually say the things they do. I still contend that if I didn’t have to work, I would take on the special education system in this country for kids with severe disabilities. I hate the ones in a certain county at a certain school. HATE. I am acutely sorry to confess that. I am healed today by walking into our home, seeing a PT working with Catherine in her gait trainer, and watching Catherine take repetitive steps at the end of an hour-long session. This stands in stark contrast to the PT who doubted Catherine could “tolerate” more than 45 minutes of PT. This stands in contrast to the PT in the county who wanted to REDUCE HER SERVICE HOURS. Fortunately, to be fair and a balanced journalist, at least she finally agreed to give her the same service hours she had last year. But really, why should I have had to argue that she needs at least the same if she’s not met her goals yet? Why do I have to argue and prove that Catherine needs a 1:1 aide to access her educational curriculum? Am I the only one who thinks a blind child who can barely move her hands needs help from someone who consistently knows her and can read her subtle communication cues? The principal actually said that they couldn’t promise a dedicated 1:1 aid because, and I quote, “What if the aid was sick for a day? We can’t be sure she can work every single day.” I told her she was absurd. I remain grateful for all the AMAZING PEOPLE who help Catherine. The staff at Delrey. Our attorney. Our private PT. My friends and family. And my colleagues at the office who shoulder me at times. So, if I focus on these feelings, perhaps the hate will disapate. And, for you, Robo, I’ll repeat: It’s not nice to hate. Maybe so. But it might be necessary not to be nice this time. Wow! Some days you’re just thankful you got up and had the stuff on your calendar that was there. Catherine didn’t have an aid on Tuesday, so I got to play that part at school. I actually love the excuse to spend a whole day with her, just the two of us. 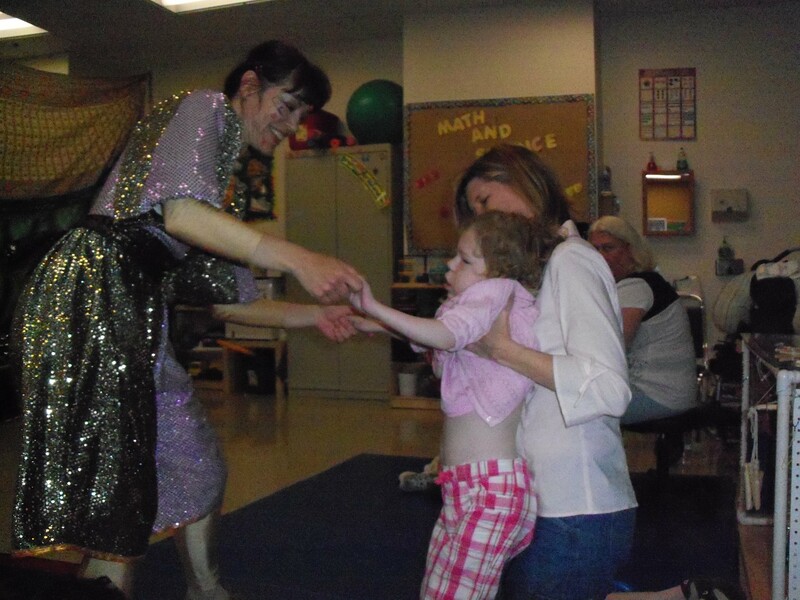 As soon as I walked into the classroom, her teacher said, “I’m so glad you’re here today. MEAC is coming!” Her eyes twinkled (literally), and I wondered what the heck was a MEAC. MEAC stands for Magical Experiences Arts Company. They don’t even have a website. If you google them, you just see a bunch of grants they’ve won. Good thing they’ve won them, too. 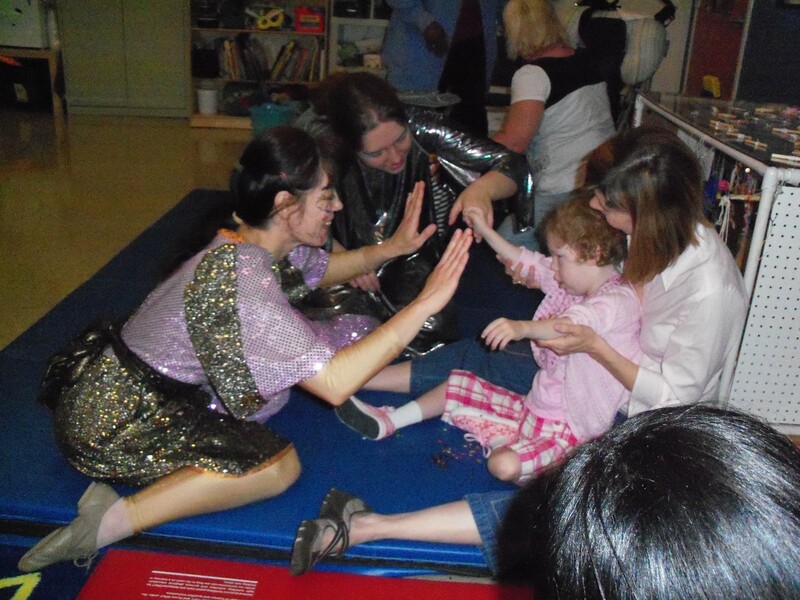 They are literally bringing magic to severely disabled kids. 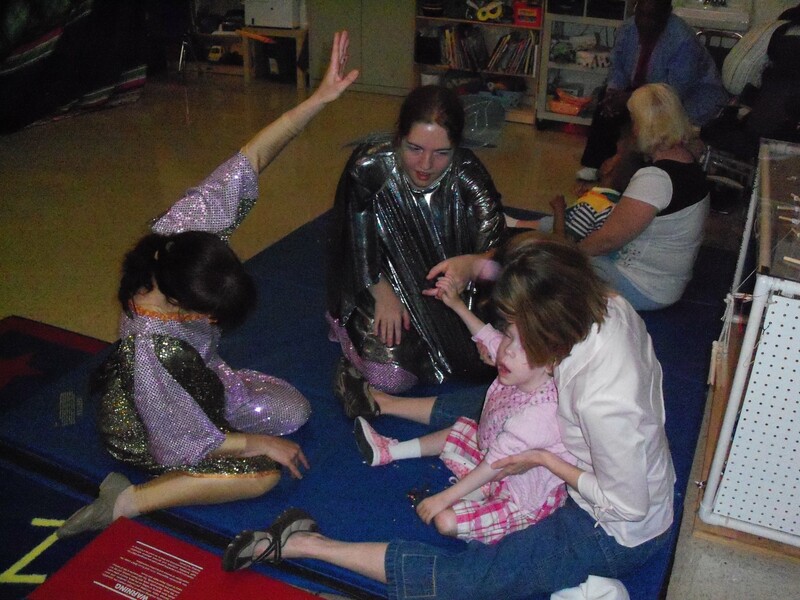 According to their brochure, they provide “interactive performances which: empower, inspire and educate children, adolescents and adults with severe multiple disabilities in a safe, nurturing environment.” They bring creative theatre programming to Level V schools and facilities. These are the places where the kids learn through the most challenges. They hung silk fabric as a backdrop to the room. “Most of these kids can’t even see that,” I thought. Yes, even I get cynical. 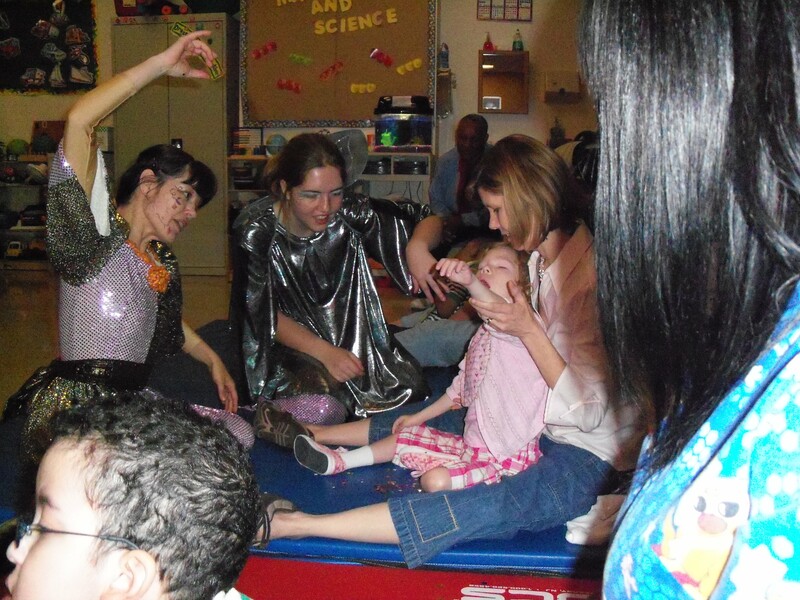 They wore sparkly costumes and paint on their faces. And just like a typical theatre troupe, they set the stage for a story that took us around the world. As we visited various countries, pixie dust fell from the sky. Wind blew fiercely. Puppets started to dance. I wondered if the kids had any idea what was happening. But as I watched closely, I understood. Catherine feels magic pixie dust that fell from the sky. Just like in normal theatre, these elements were merely props. The actors told the real story by communicating with their audience. And unlike any I’ve ever seen before, these people actually communicated with these kids. They SAW them. They looked at each child with such intensity it was nearly uncomfortable at first. But then, my eyes welled up. This complete stranger actually sees my daughter. She’s not afraid of the disability. She’s actually looking right at it. She’s not afraid of the little girl. She’s actually trying to find her. I’m welling up again just writing about it. She’s watching her. She’s listening to her. She’s loving her. She’s touching her. She’s communicating with her. And Catherine began communicating back. At one point in the performance, the fairie became a puppet that would spring to life only if the child touched her. Catherine and the puppet start to dance. I helped Catherine do that and the puppet awakened and wanted to dance. I moved Catherine’s arms to pull the invisible puppet strings and the two began a dance. At first, it was limited to Catherine’s upper body. I swayed with her and kept moving her arms. But then, I felt Catherine’s energy shift. The energy starts to shift. I helped her stand, and she danced upright with the puppet. Somehow she felt this energy of having been completely and utterly seen by another. She rose with it. And she danced. When you get the chance, I hope you DANCE! Another little boy moved in a similar way. As the puppet moved to other children, the teacher and I realized Catherine and the other little boy were still standing – still dancing. We moved them together, put Catherine’s arm on his shoulder, held out their other hands to each other, and stabilized them for a dance. As far as I was concerned, we were at the prom. And the theme that year was magical fairies.